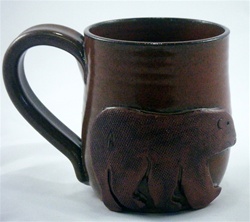 MudWorks Pottery introduces the Bear Mug made by JoAnn Stratakos. Product Dimensions are approximately 5.5" Height by 3.5" Width. Glaze color varies to artists' choice, and the glaze color may not be the same color as pictured.